The "Model Information" table in Output 75.8.1 describes the method and options used in the multiple imputation process. By default, a regression method is used to impute missing values in each continuous variable. The "FCS Model Specification" table in Output 75.8.2 describes methods and imputed variables in the imputation model. The procedure uses the logistic regression method to impute the variable Species, and the regression method to impute variables Height and Width. The "Missing Data Patterns" table in Output 75.8.3 lists distinct missing data patterns with corresponding frequencies and percentages. X X . 5 5.75 24.620000 .
. X . 2 2.30 31.500000 . When you use the DETAILS keyword in the LOGISTIC option, parameters estimated from the observed data and the parameters used in each imputation are displayed in the "Logistic Models for FCS Method" table in Output 75.8.4. 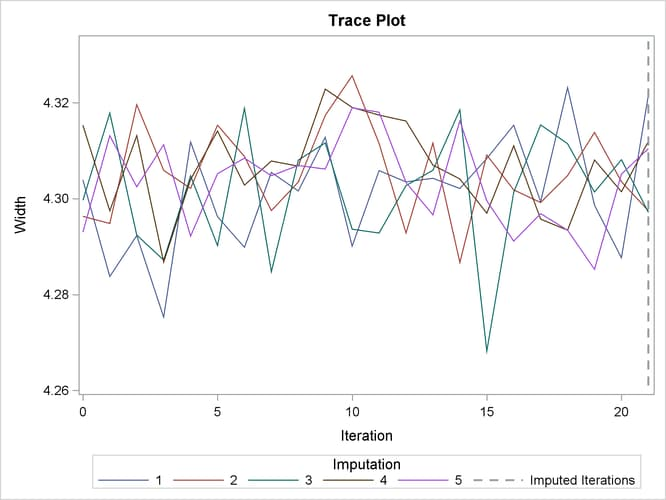 With ODS Graphics enabled, the PLOTS=TRACE option displays trace plots of means for all continuous variables by default, as shown in Output 75.8.5 and Output 75.8.6. The dashed vertical lines indicate the imputed iterations—that is, the variable values used in the imputations. The plot shows no apparent trends for the two variables. After the completion of five imputations by default, the "Variance Information" table in Output 75.8.8 displays the between-imputation variance, within-imputation variance, and total variance for combining complete-data inferences for continuous variables. 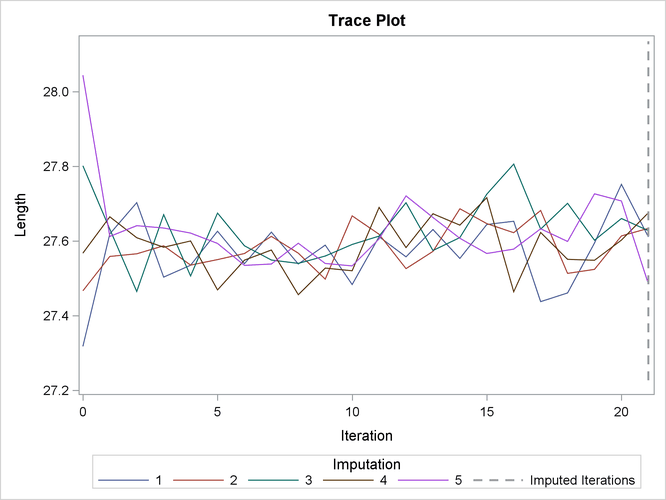 The relative increase in variance due to missingness, the fraction of missing information, and the relative efficiency for each variable are also displayed. These statistics are described in the section Combining Inferences from Multiply Imputed Data Sets. The "Parameter Estimates" table in Output 75.8.9 displays a 95% mean confidence interval and a t statistic with its associated p-value for each of the hypotheses requested with the default MU0=0 option.